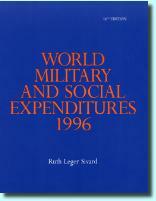 Ruth Sivard's World Military and Social Expenditures was the first publicly available comparison of military and social spending by world governments. She also authored prescient reports on women's rights and the world energy crisis. Complimentary copies of the books are available to scholars and activists. See below for a free download of WMSE 1996. Mrs. Sivard had been a high-ranking economist for the US State Department and the Arms Control and Disarmament Administration when she decided to form her own company to publish her reports. She was able to find reliable sources for the detailed statistical information she published. Her work was internationally recognized by scholars and sponsored in part by The Rockefeller Foundation, The MacArthur Foundation, Union of Concerned Scientists, SANE/FREEZE and UNESCO. "I can think of few subjects that should be of deeper concern to all humanity than the problem of how to restrain the world’s military colossus and turn the race for arms into a race for peaceful development." "The purpose of this report is to provide an annual accounting of the use of world resources for social and for military purposes, and an objective basis for assessing relative priorities. "In bringing together military and social data for direct comparison, the report bridges a gap in the information available to the public. It is hoped that this will help to focus attention on the competition for resources between two kinds of priorities." 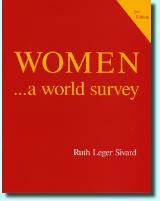 Women... a World Survey was produced by Ruth Sivard in two editions, in 1985 and 1995. “The purpose of this survey is to bring together in an easily accessible and abbreviated form a range of factual information on the situation of women in the world community today. "My hope is that this will help open the door to others who began as I did with little information and a willingness to try to see what is at issue. 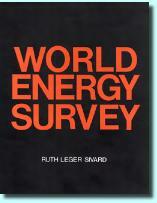 Ruth Sivard produced the World Energy Survey in two editions, in 1979 and 1981. “The purpose of this report is to summarize a large fund of information on the international energy situation in a way that will contribute to public understanding of the basic problems and options. “It is addressed not to the specialist but to the individual who is interested in seeing his personal and national energy needs in a broader context. The setting is global because the energy future is one of growing world interdependence. Ruth Sivard's reports are "the most important economic, social and political research of our time." World Military and Social Expenditures.